With Windows 8 bearing a good share of the blame for the declining PC market, HP is falling back on Windows 7 for its latest marketing push. The world’s second largest computer maker recently began promoting PCs loaded with Windows 7 on its U.S. website, buoyed by an email marketing push. “Back by popular demand,” HP’s U.S. website reads, offering customers the chance to get $150 off a new computer loaded with Windows 7. While other manufacturers—including Dell and Lenovo—also sell a limited number of Windows 7 PCs to consumers, only HP is advocating the aging OS with such gusto. PC shipments have been declining for seven consecutive quarters, so HP’s Windows 7 hype could be an attempt to bolster lagging sales by reverting to Microsoft’s more successful (and less contentious) version of Windows. Microsoft has yet to put a firm end date on when computer makers have to stop pre-installing Windows 7 on new PCs, according to the company’s lifecycle page, and that is unlikely to change anytime soon. With a potential mass migration from Windows XP coming in 2014, having Windows 7 as an option could keep Metro haters within the Windows ecosystem. Plus, Microsoft probably doesn’t want to see a repeat of the Vista era, when Dell used the Windows Pro-level “downgrade” rights to sell more Windows XP devices such as the Inspiron 1525. Then again, with extended support for Windows XP coming to an end on April 8, HP could be hoping to get an early jump on deals to attract longtime XP users shopping for a new PC. Windows 7's traditional interface would be much less of a shock to reluctant XP upgraders than Windows 8's Live Tiled Start screen. 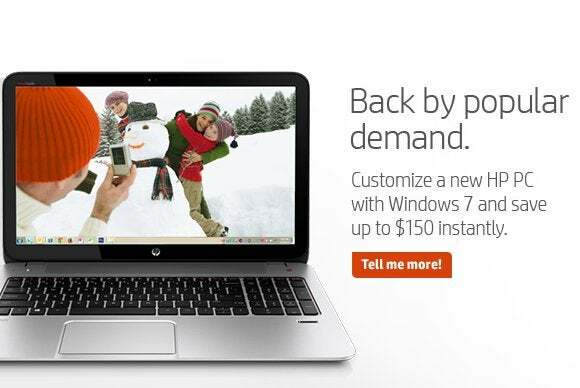 Even with this new promotion HP’s selection of Windows 7 PCs is severely limited. At this writing, the company offered only two laptops running Windows 7, compared to 28 with Windows 8.1 and five (five!) with Chrome OS. Moving over to desktops, HP offers three with Windows 7, seven with Windows 8, and 26 with Windows 8.1. Perhaps, if this Windows 7 push is successful, the company will expand that lineup, but that is far from clear. Of course, the answer to why HP is hyping Windows 7 could also be “none of the above” as Stephen Baker, the Vice President of Analysis for the NPD research group, told PCWorld via email.